Some 13 years after its inception, Drumlins Integrated Primary School opened the doors to its permanent Ballynahinch location in late 2017. From its inaugural class of just 12 pupils in 2004, the school has grown to more than 200 students. The diverse, vibrant colours of the school interiors aim to reflect its mission statement of ‘happy and successful learning in an integrated environment, free from prejudice’. A core value of the school’s community is to provide an environment for the children that is free from violence, fear and intolerance. The school looks to prepare its pupils to live and work together through play and learning from an early age. Later in life, they will become ambassadors for the Integrated Education Movement that promotes acceptance of others and their beliefs through talking, listening and understanding. The physical environment is crucial to bringing this vision to life, optimising the learning and social experience of students and teachers. The school’s L3.5m purpose-built facilities are located on a prominent drumlin in the town centre, overlooking the Co. Down countryside. Karl Moffett of Moffett & Sons worked with the school to create the vibrant, multicolour interiors. Postura+ chairs of different sizes were selected for classrooms and the library in Tangerine Fizz, Aqua Blue, Grape Crush, Forest Green, Poppy Red, Sun Yellow, Lime Zest. Postura+ task chairs were chosen in Sugar Plum for the IT room. The Aedas-designed Taichung Commercial Bank Headquarters Project in Taiwan topped competition from around the world to win the Commercial Mixed-use – Future Projects category at this year’s World Architecture Festival (WAF) Awards. Designed by Aedas chairman and global design principal Keith Griffiths, the project is a 200m-high tower of HQ office and luxury hotel space in the commercial centre of the Taiwan city. 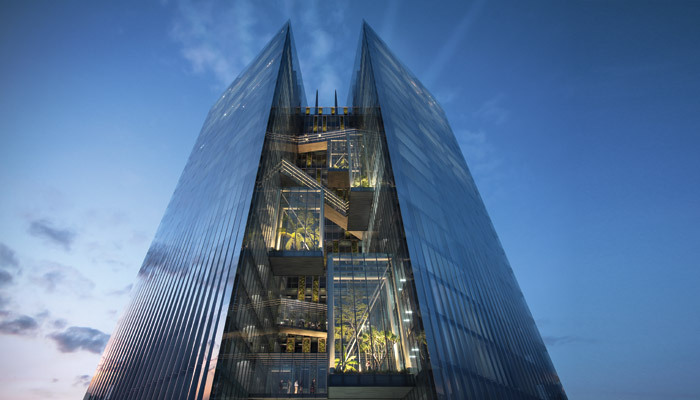 The design creates two ‘separate’ towers with a vertical void in the middle to connect them and capture the large facilities. A series of ‘floating’ transparent glass boxes for large functions including exhibition areas, sky gardens, conferencing facilities, and swimming pool is situated inside the void. A must-attend event for designers, architects, specifiers and decision-makers is the Surface Design Show, co-located with Light School and Stone Hub at the Business Design Centre, London. Source products, meet suppliers, network, hear from industry professionals, gain new insights and connect with innovative and exciting materials: it’s all for the taking from 5-7 February. In addition to some 150 exhibitors showing the best and latest in surface materials, there will be: around 45 speaker presentations; awards; Surface Spotlight Live, the best in innovative and inspiring materials; and two special materials’ focuses. HI-MACS, a contemporary-style solid surface, has been newsly featured in one of the most symbolic art deco buildings in London: the Hoover Building. Built in the Thirties for the Hoover company, it has been completely renovated by IDM Properties and converted into luxury apartments. HI-MACS has been used in all the kitchen spaces. Alastair Roberts has been appointed director at architecture practice Darling Associates. With 19 years’ experience working in management roles in the architecture sector, Roberts joins Darling Associates from architecture design practice NORR Consultants, where for the past two years he was director at its London office. 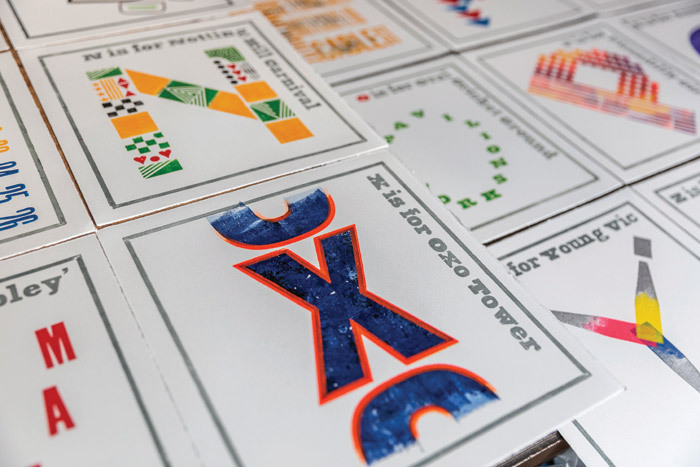 Alan Kitching, the maestro of the letterpress, has a new book coming out, his own A to Z of London. He has spent most of his professional life in the city, exploring and enjoying its iconic landmarks as well as its more obscure nooks and crannies. This personal project is a subjective A to Z of his favourite haunts in the capital. The limited-edition lexicon of London marries the individual letters of the alphabet with the many historic locations, contemporary buildings, national monuments, sports grounds, hotels and eponymous retailers that contribute to the fabric of the city. Available as a boxed set of 26 letters with a personal introduction and glossary, there are just 25 impressions available. With type founts from his immense collection, Alan has used letters that in some cases appear to depict the relevant location and at other times the composition of the letter itself resonates with its sense of place. The project, in collaboration with Karoline Newman, has taken nearly two years from inception to its completion. It was inspired by William Nicholson’s Alphabet and London Types, first printed from intricate woodcuts in the 19th century. Alan Kitching’s A to Z of London starts with the Arcelor Mittal Orbit & Slide that dominated the skyline at the London 2012 Olympics. There are witty compositions for the letters ‘O’ for The Oval and ‘W’ for Wembley and a meandering ‘T’ for Thames. London Glassblowing is showing at this year’s Collect: The International Art Fair for Modern Craft and Design. 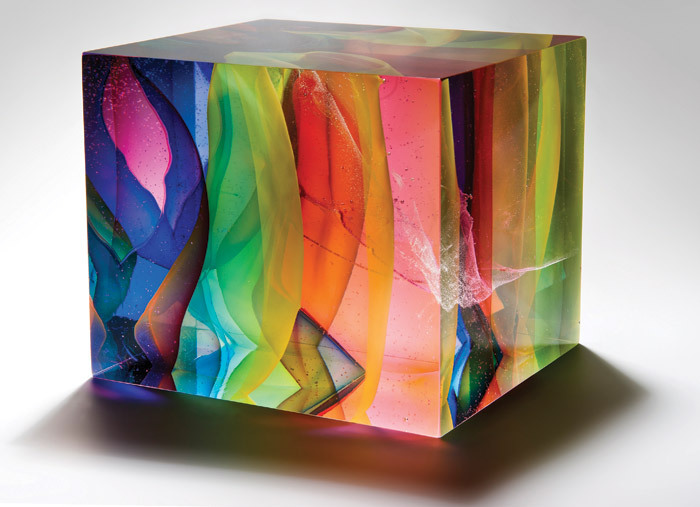 At London’s Saatchi Gallery from 28 February to 3 March, new pieces from the country’s top glass makers will be on show, such as Louis Thompson, Anthony Scala, Peter Layton and Tim Rawlinson (pictured), who had a solo exhibition in the gallery in November. In addition to Collect, London Glassblowing has its own exhibition, Gather, from 9 February to 10 March at its studio in Bermondsey Street, London.